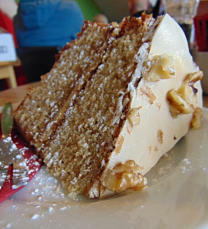 A view of one of cakes at Tearoom at Daisy Clough Nurseries, you can see rest of the ride photos when the webmaster last visited this tearoom at this link. The tearoom at Daisy Clough Nurseries near Scorton Address: Daisy Clough Nurseries, Station Lane, Scorton, Preston, PR3 1AN Phone number: 01524-587066 Opening hours: Open Monday to Saturday from 9am to 5pm. On Sunday from 10am to 4pm. Website: http://www.daisyclough.com. Notes: Before ordering get a table number. You can find more photos of this Tearoom in the following photo galleries on the website: Click here for a full list. The following cycling routes stop at this Tearoom: Click here to see full list of routes. You can view a Google Map of where you find Daisy Clough Nurseries at this link. You can find more photos of this Tearoom in the following photo galleries on the website 18th February 2018 ride to Scorton and along Condor Valley. The following cycling routes stop at this Tearoom A 31.3 mile cycle route to Scorton and along the Condor Valley, starting and finishing at Condor Green. A 39.9 mile cycle route to Garstang, starting and finishing at Halton Station.